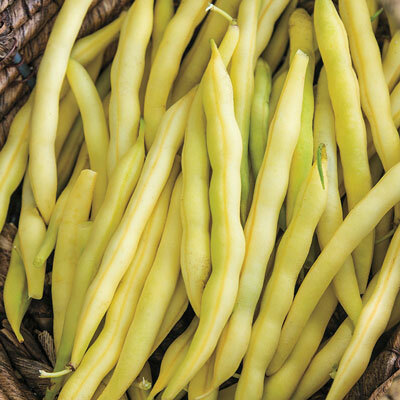 Cherokee Wax Yellow Bush Bean | Henry Field's Seed & Nursery Co.
Stays tender frozen, canned or fresh. Developed at Clemson University. Stringless even when mature. Unlike most bean varieties, Cherokee Wax stays tender when frozen, also good canned or fresh. Has attractive purple blossoms. Tender, slightly nutty flavor. 51 DAYS. Seed Counts: A 2-oz. packet of snap bean seeds (bush and pole) contains about 150 seeds and sows a 25-ft. row. A 2-oz. packet of lima bean seeds (bush and pole) contains about 50 seeds and sows a 15-ft. row. Flower Form: Attractive purple blossoms. Soil Requirements: Well drained, enriched soil. Seed Count: A 2-oz. packet of snap bean seeds (bush and pole) contains about 150 seeds and sows a 25-ft. row. Fruit: 5- to 6-inch-long pods with black seeds. Tender, slightly nutty flavor.